The R&S CMX500 is ideal for tests in 5G NR standalone (SA) mode. Test and measurement specialist Rohde & Schwarz and Prisma Telecom Testing, a leading supplier of performance testing solutions, have successfully completed the verification of a 5G NR standalone registration including data transfer. Rohde & Schwarz presented this test setup for the first time to the public at MWC 2019 in Barcelona. While initial 5G New Radio deployments will focus on a non-standalone (NSA) mode, which always requires an LTE connection as anchor, the next step will be deployments in a standalone mode (SA). Rohde & Schwarz and Prisma Telecom Testing have achieved another important milestone in the commercial evolution of 5G New Radio: The two companies successfully verified a 5G NR standalone registration including data transfer using a test solution based on an R&S CMX500 5G NR signaling tester and a Prisma UeSIM multiterminal simulator. The test setup provided a 5G network simulation to test a realtime connection on a carrier with 100 MHz bandwidth in line with 3GPP release 15 in standalone mode (option 2). Using this R&S CMX500 based setup and the Prisma UeSIM, developers of 5G user equipment or network infrastructure can measure compliance to 3GPP Rel 15 standalone mode of their products already today. They can verify in detail the signaling procedures needed to establish a 5G standalone registration and a data connection. Simultaneously, they can generate data traffic to and from the Prisma UeSIM. Throughput measurements help to optimize 5G transmission settings. 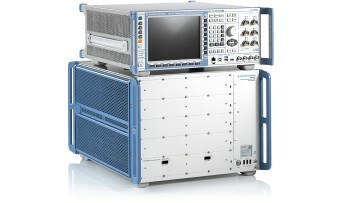 For more information about Rohde & Schwarz and Prisma Telecom Testing at Mobile World Congress 2019, visit www.rohde-schwarz.com/mwc and www.prismatelecomtesting.com/. A leading supplier of innovative performance testing solutions for the wireless industry, PRISMA Telecom Testing has been active since 1986 in the wireless world. The largest network manufacturers and service providers worldwide have relied on PRISMA for over a decade for complete Radio Access Network testing over the radio, to accelerate the deployment of their technology and the validation of their network equipment. PRISMA solutions provide the unique capability to verify the functionality of complex network ecosystems across both the newest and legacy access technologies, from 2G through to 5G NR, for performance full stack testing over the radio in terms of ultra-low latency, high reliability, extreme throughput and massive connectivity. PRISMA is headquartered in Milan, Italy, with its own offices in the US, France, China, Sweden and Finland and partners across Europe, Asia and the Americas. For more information about PRISMA and its solutions, visit www.prismatelecomtesting.com, follow PRISMA on LinkedIn (https://www.linkedin.com/company/prisma-telecom-testing/) or contact PRISMA at info@prismatelecomtesting.com.